For several decades, glucocorticoids have been used empirically to treat rapid progressive GN. It is commonly assumed that glucocorticoids act primarily by dampening the immune response, but the mechanisms remain incompletely understood. 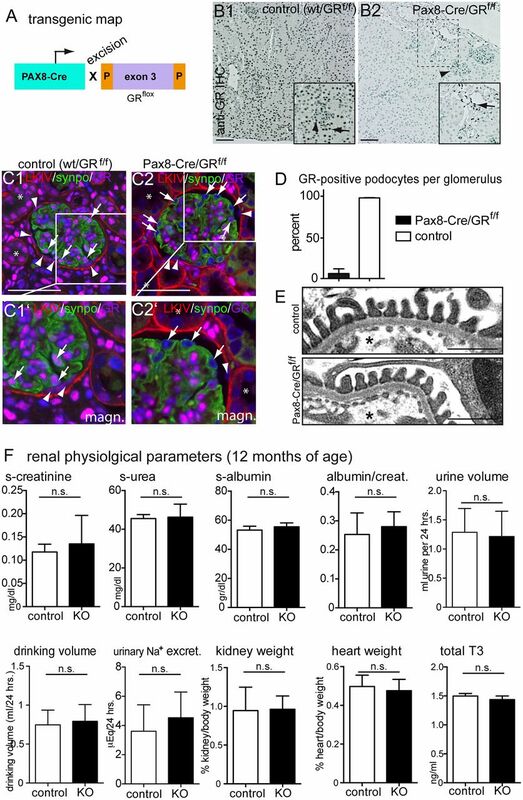 In this study, we inactivated the glucocorticoid receptor (GR) specifically in kidney epithelial cells using Pax8-Cre/GRfl/fl mice. Pax8-Cre/GRfl/fl mice did not exhibit an overt spontaneous phenotype. 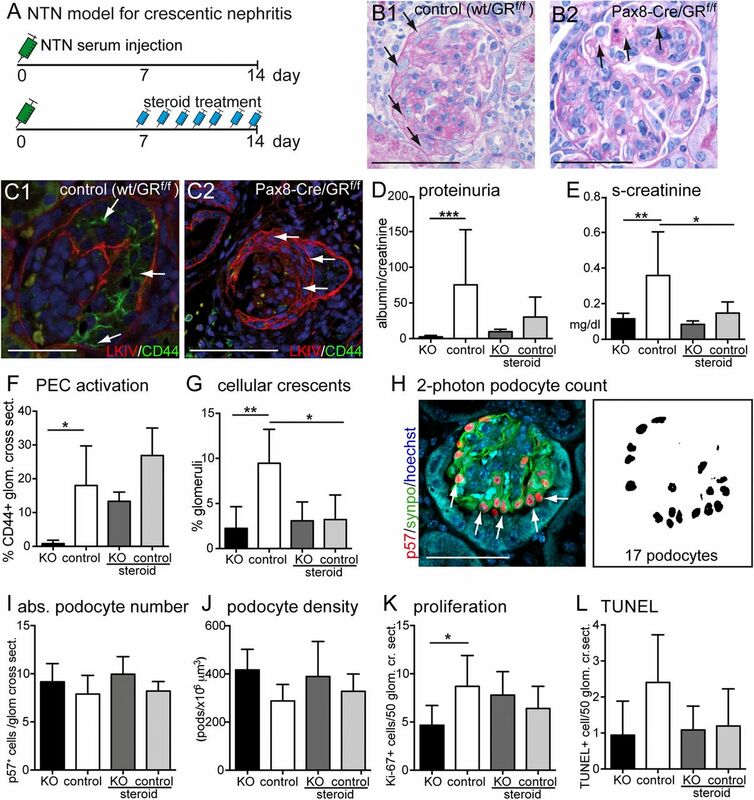 In mice treated with nephrotoxic serum to induce crescentic nephritis (rapidly progressive GN), this genetic inactivation of the GR in kidney epithelial cells exerted renal benefits, including inhibition of albuminuria and cellular crescent formation, similar to the renal benefits observed with high-dose prednisolone in control mice. However, genetic inactivation of the GR in kidney epithelial cells did not induce the immunosuppressive effects observed with prednisolone. In vitro, prednisolone and the pharmacologic GR antagonist mifepristone each acted directly on primary cultures of parietal epithelial cells, inhibiting cellular outgrowth and proliferation. In wild-type mice, pharmacologic treatment with the GR antagonist mifepristone also attenuated disease as effectively as high-dose prednisolone without the systemic immunosuppressive effects. Collectively, these data show that glucocorticoids act directly on activated glomerular parietal epithelial cells in crescentic nephritis. Furthermore, we identified a novel therapeutic approach in crescentic nephritis, that of glucocorticoid antagonism, which was at least as effective as high-dose prednisolone with potentially fewer adverse effects. In the late 1940s, cortisone isolated from the adrenal cortex became available.1 It was first used in nephrology in 1950 to empirically treat patients with nephrotic syndrome.2 Despite their significant side effects, glucocorticoids have now become central in the treatment of most glomerulonephritides. An immune-mediated pathogenesis has been generally accepted for most glomerulopathies, and glucocorticoids are generally believed to act primarily via their immunosuppressive effects. However, experimental evidence in vivo is still needed to clarify the primary mechanism of action of glucocorticoids. GR expression in proliferative lesions. (A) Schematic of a glomerulus with a proliferative lesion (i.e., cellular crescent in crescentic GN; right). Obstruction of the tubular outlet by a crescent (arrow) triggers irreversible loss of the nephron and renal function. Blue, podocytes; light green, quiescent PECs. (B and B′) Immunofluorescence staining of a normal human glomerulus (LKIV stains PEC matrix of Bowman’s capsule in red; arrows with tails), podocytes (antisynaptopodin; green), and the GR (magenta). GR expression is visible in all glomerular cells, including podocyte (arrow) and PEC nuclei (arrowheads). (C–C2) Serial sections of a human biopsy with an extracapillary proliferative lesion (arrowheads in C and C′; Goodpasture syndrome). (C1) GR was expressed at low levels in podocytes, which were rarely observed in cellular crescents. GR colocalized with PEC activation marker CD44 (arrows in C2) and PEC matrix (LKIV; arrows with tails). GR (magenta) is expressed in all cell nuclei within sclerotic lesions. GR expression in murine glomerulus. Scale bars, 100 μm. (D and D′) Normal mouse glomerulus (red; PEC matrix [LKIV]; arrows with tails), podocytes (antisynaptopodin; green), and GR (magenta) show ubiquitous nuclear staining of the GR in all glomerular cells. Activated PECs express the GR in experimental GN in mice in proliferative and sclerotic lesions. (E1) Crescentic nephritis model (NTN): CD44–positive activated PECs (green; arrows) deposit PEC matrix (LKIV; red; arrows with tails) and populate a cellular lesion. Scale bars, 50 μm. The glucocorticoid receptor (GR) binds glucocorticoids in the cytoplasm, dimerizes, and translocates to the nucleus, where it acts as a transcription factor.7 Glucocorticoid effects vary significantly between different cell types. For example, in neutrophils, GR activation can induce survival,8 whereas apoptosis is induced in lymphocytes (T, B, or NK cells).9 Because the GR is expressed in most tissues, glucocorticoids act on not only cells of the immune system but also, many cell types consistent with the broad range of mostly catabolic side effects. Apart from crescentic GN, glucocorticoids are also effective in less inflammatory forms of GN (e.g., IgA nephropathy, membranous nephropathy, minimal change nephropathy, and FSGS). These clinical observations suggest direct effects of glucocorticoids on renal cells. This study set out to test this hypothesis. The focus was placed on proliferative lesions in GN (i.e., crescentic GN). Under physiologic conditions, the GR was expressed ubiquitously in the nuclei of all human glomerular cells, including PECs and podocytes (Figure 1B).10,11 GR expression in renal biopsies of patients or mice with crescentic GN was detectable in proliferative lesions (Figure 1, C–E). In these lesions, the GR colocalized with markers of PEC activation and extracellular matrix (CD44 and LKIV, respectively). These findings suggested that cells in proliferative lesions (mostly PECs) may have the capability to respond directly to glucocorticoid treatment. The GR was inactivated specifically within kidney epithelial cells in Pax8-Cre/GRfl/fl mice from embryonic day approximately 16.5. GR expression was abolished specifically in renal epithelial cells (Figure 2, A–D)12,13 (i.e., podocytes, PECs, and tubular cells). Renal interstitial cells continued to express the GR. mRNA expression levels for the GR were reduced significantly as well as those for GR–regulated genes forkhead box O3 and glucocorticoid–induced leucine zipper14 (Supplemental Figure 1). Pax8-Cre/GRflox mice were born at expected Mendelian frequencies. The enzyme hydroxysteroid(11-β)dehydrogenase 2 inactivates endogenous glucocorticoids. As shown in Supplemental Figure 2, it is expressed in the proximal and distal parts of the nephron, suggesting that most tubular cells are protected from glucocorticoid effects. This is consistent with our finding that Pax8-Cre/GRfl/fl mice did not develop any overt spontaneous phenotype up to 12 months of age (Figure 2, E and F) (periodic acid–Schiff [PAS] staining not shown). Collectively, these data suggest that the GR is dispensable in late development. Renal epithelial GR expression is dispensable for normal renal function in mice. (A) Transgenic map for cell-specific inactivation of the GR specifically in renal epithelial cells in vivo. (B) Anti–GR immunohistochemical staining on paraffin sections of murine renal tissue (B1; arrowhead, glomerulus; arrow, tubular cells). (B2) Nuclear expression of the GR was abolished in renal epithelial cells in the cortex of KO animals. In renal interstitial cells, GR expression was unaltered (arrow in B2). (C) Immunofluorescence costaining of GR (magenta), PEC matrix (LKIV; red), podocyte marker synaptopodin (synpo; green), and DNA (Hoechst; blue) confirmed the specificity of the anti-GR antiserum as well as selective deletion of GR in renal epithelial cells (including parietal cells [arrowheads] and podocytes [arrows]). Glomerular nonepithelial cells still stained positive for GR. *Efficient GR inactivation was also confirmed in tubule cells. (D) Quantitative analysis of the efficiency of deletion of GR from podocytes (>95% efficiency; P<0.001). (E) Transmission electron microscopy analysis showed no abnormalities of control versus KO mice (n=3 mice each). *Capillary lumen. (F) Renal physiologic parameters at 12 months of age showed no significant differences between Pax8-Cre/GRfl/fl mice (KO) and controls (n=4 per group). Because of minor extrarenal activity of Pax8-Cre in the thyroid, thyroid hormone levels (total T3) were determined in serum. Data are expressed as mean±SD; t test. Scale bars, 100 μm in B; 50 μm in C; 500 μm in E.
To assess the functional role of epithelial GR signaling in the renal glomerulus, crescentic GN was induced by sheep antiserum raised against murine kidney cortex (nephrotoxic serum nephritis [NTN]) (Figure 3, A–C). In this standard model for crescentic GN, podocytes are injured, PECs become strongly activated, and proliferative lesions (i.e., cellular crescents) form between days 8 and 14.5 Treatment with high-dose glucocorticoids, the standard treatment in humans for crescentic GN, was initiated 7 days after induction, and it effectively ameliorated albuminuria, renal function, and formation of cellular crescents (Figure 3, D–L). In all experimental groups, no significant differences in glomerular deposition of sheep and mouse IgG and C3 were observed (Supplemental Figures 3 and 4). Mouse anti–sheep IgG levels as a surrogate parameter for the autologous immune response were also not statistically different among the experimental groups (Supplemental Figure 5). Experimental crescentic GN is attenuated by overactivation as well as inactivation of GR. (A) Schematic of the experimental setup. In brief, 7 days after injection of nephrotoxic nephritis serum, animals received daily intraperitoneal injections of prednisolone (2.5 mg/kg). In all experiments, nontransgenic littermates (Pax8-Cre negative, GRfl/fl) were used as controls. (B) Representative PAS–stained paraffin sections from control animals show glomerular crescent formation (arrows in B1). Note that, in KO mice, podocyte alterations with vacuole formation but less crescent formation were observed (arrow in B2). (C) CD44 expression in cellular crescents was reduced in KO animals versus controls (arrows; LKIV, PEC matrix in red; PEC activation marker CD44 in green; and DNA Hoechst in blue). (D–G) Proteinuria, renal function (serum creatinine), and crescent formation were ameliorated in prednisolone-treated animals (steroid). Genetic inactivation of GR ameliorated all of these parameters as well, including PEC activation (CD44 expression; n=7–9 each). (H) Absolute numbers of podocytes were determined using an established method improved by two-photon microscopy (representative immunofluorescence staining of a glomerulus for nuclear podocyte marker p57 in red and podocyte marker synaptopodin [synpo] in green). Similarly, absolute numbers of Ki-67– or TUNEL-positive cells were determined. (I–L) Quantification of podocyte number, density, number of proliferating glomerular cells, and TUNEL–positive glomerular cells. Bars of KO and control are shown in black and white, respectively (first and second bars). Bars of steroid–treated KO and control animals are shown in dark gray and light gray, respectively. Data are expressed as mean±SD; n=7–9 per group. cr. sect., Glomerular cross-sections. *P<0.05; **P<0.01; ***P<0.001. Scale bars, 100 μm in B1, C2, and H; 75 μm in B2 and C1. It was expected that genetic inactivation of GR signaling in kidney cells would abolish at least some of the beneficial effects of glucocorticoid treatment in crescentic GN. However, remarkably, albuminuria and cellular crescent formation were inhibited at least as effectively by genetic GR inactivation alone, similar to high-dose glucocorticoids (compare steroid-treated controls with knockout [KO] mice in Figure 3, D–G). Of note, high–dose glucocorticoid treatment on top of genetic GR inactivation did not exert any additional beneficial effects, indicating that the immunosuppressive effects of high-dose prednisolone did not exert additional beneficial effects in this model of crescentic nephritis (compare KO with steroid-treated KO). Podocyte numbers were determined using a recently published method.15 In this study, this method was improved further using two-photon microscopy to analyze optically defined 2-μm sections. Genetic GR deletion preserved podocyte numbers as effectively as high–dose glucocorticoid treatment (Figure 3, H–J). Similarly, PEC activation and proliferation were reduced to a similar extent in KO versus control, consistent with reduced crescent formation and preservation of renal function (Figure 3, F–L). PEC activation did not seem significantly reduced in the steroid-treated mice. This may be due to the fact that PEC activation was quantified by presence or absence of CD44-positive cells within individual glomeruli. We believe that this method of analysis was the least biased. CD44 may also be expressed by monolayers of PECs on Bowman’s capsule, because a cellular crescent may not yet have formed or may be outside the plane of section. Therefore, CD44 expression and cellular crescents may show different results. In summary, mice with absent epithelial GR signaling were protected from crescentic GN as effectively as animals treated with high-dose glucocorticoids. To investigate the immunosuppressive effects, spleen and kidney weights were compared between experimental groups. Kidney weight, a surrogate parameter for renal edema, increased significantly in NTN in steroid-treated mice and mice with GR inactivation (Figure 4A). In contrast, spleen weight as a surrogate of systemic inflammation was significantly reduced in steroid-treated animals but was not reduced in mice with GR inactivation, although NTN was attenuated as effectively in the latter (Figure 4B). Within the kidney, glucocorticoid treatment reduced infiltrating inflammatory cells (T cells and macrophages) independent of genetic GR inactivation (Figure 4, C–F). Similarly, chemokine expression in total kidney cortex was affected by glucocorticoid treatment but did not correlate with NTN disease activity (Figure 4G). In summary, glucocorticoid treatment inhibited systemic inflammation as well as infiltration and activity of immune cells within the kidney. However, crescentic GN was also ameliorated by inactivation of the GR in kidney epithelial cells alone without obvious effects on the immune response. Inflammatory response is attenuated only by glucocorticoid treatment and not by kidney specific inactivation of the GR in crescentic glomerulonephritis. (A) Kidney-to-body weight ratios were increased in crescentic nephritis but did not correlate with GR KO or high–dose prednisolone treatment (steroid) 14 days after nephrotoxic serum injection. (B) Spleen-to-body weight ratios as a surrogate parameter for systemic inflammation were reduced significantly by steroid treatment but not reduced by GR KO. (C–F) CD3–positive T cells and ERHR3-positive macrophages were quantified within the glomerulus (arrowheads) and tubulointerstitium (arrows). Infiltrating cells were reduced significantly by high–dose prednisolone treatment (steroid) but not reduced by KO of GR (KO). Scale bars, 100 μm. (G) Cytokine mRNA expression levels (relative to mean of weight) in total renal cortex tissue lysates. Expressions of TGF-β, IL-6, and CCL5 were suppressed by prednisolone treatment. 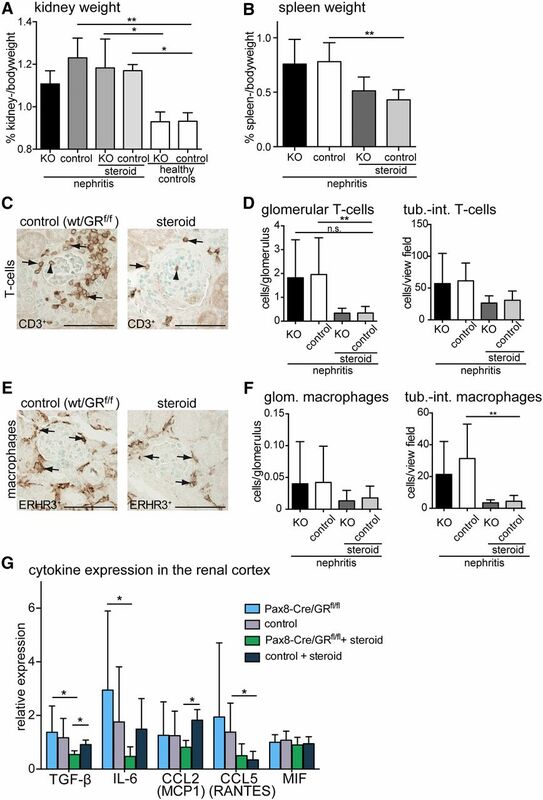 GR KO correlated with decreased expression of TGF-β and CCL2. Data are expressed as mean±SD (n=7–9 per group; genotypes of controls [wt/GRfl/fl] and KOs [Pax8-Cre/GRfl/fl]). *P<0·05; **P<0·01. Cellular outgrowths from isolated capsulated glomeruli of Pax8-Cre/GRfl/fl and wt/GRfl/fl controls have been used as an in vitro model for crescent formation.16 Cellular outgrowth of PECs and podocytes was impaired in glomeruli derived from Pax8-Cre/GRfl/fl KO mice. Outgrowing epithelial cells were less activated—consistent with our results in vivo—suggesting that GR inactivation induces intrinsic inhibitory effects in glomerular epithelial cells (Figure 5, A–D). 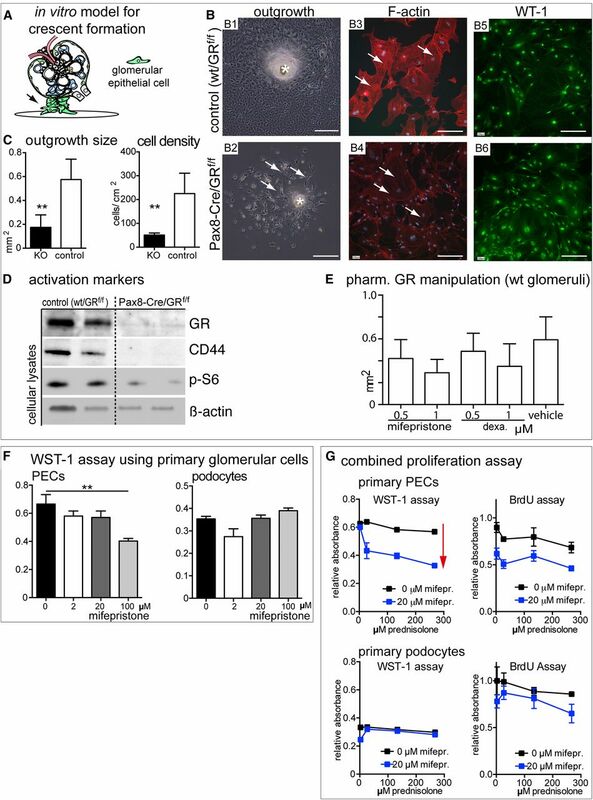 Similar results were obtained by pharmacologic inhibition of the GR (mifepristone) on cellular outgrowths from isolated glomeruli of wild-type (WT) mice (Figure 5E). Activation of GR using dexamethasone as well as GR inhibition using the partial antagonist mifepristone inhibited cellular outgrowths to a similar extent in a dose-dependent fashion. For a proliferation assay, stable primary cultures of pure WT PECs or podocytes were treated with the GR antagonist mifepristone.17 Mifepristone inhibited proliferation significantly more in PECs compared with high-dose prednisolone (Figure 5, F and G, red arrow). 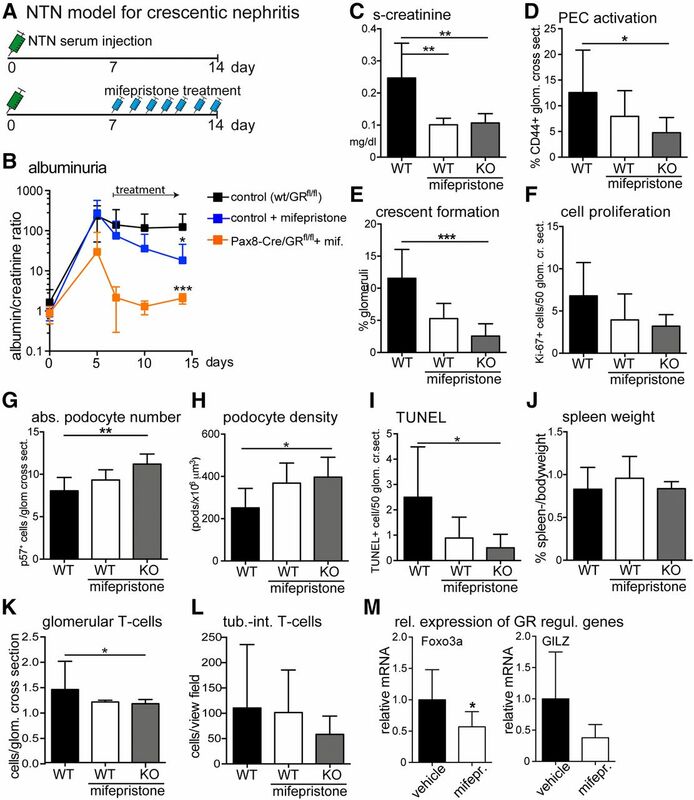 These results show that pharmacologic inhibition of GR recapitulates the effects of genetic inactivation in vivo, specifically in PECs, which form the major part of proliferative lesions. Genetic deletion or pharmacological inhibition of GR decreases proliferation and migration of primary PECs. (A) In vitro model for cellular crescents.16 Capsulated glomeruli were isolated from GR KO or Cre–negative littermate controls. Cellular outgrowths were analyzed on day 6. (B1 and B2) Cellular outgrowth was impaired by GR KO (arrows). *Glomerulus (phase contrast image). (B3 and B4) Actin stress fibers were reduced by KO of GR (arrows show phalloidin staining). (B5 and B6) Cellular outgrowths consisted exclusively of glomerular epithelial cells (i.e., PECs and podocytes; WT1 immunofluorescence staining). Scale bars, 400 μm in B1 and B2; 200 μm in B3–B6. (C) Outgrowths from GR KO animals were significantly larger and contained more cells (n=4; 10–15 glomeruli per animal). **P<0.01. (D) Immunoblot analysis of lysates of cellular outgrowths. GR was undetectable in KOs. PEC activation marker (CD44) and the phosphorylated form of S6 ribosomal protein (p-S6) of the mammalian target of rapamycin pathway were reduced in GR KO outgrowths. (E) Pharmacologic treatment of outgrowing cells from WT capsulated glomeruli. A dose-dependent inhibition of cellular outgrowth was observed for partial GR antagonist mifepristone and the agonist dexamethasone (dexa.) on day 8 (n=4; ten capsulated glomeruli per experiment; vehicle, 0.1% DMSO). (F and G) Effects of pharmacologic manipulation of GR activity in primary PECs and podocytes. (F) Primary cultures of murine PECs or podocytes17 were treated with increasing doses of mifepristone (n=5) for 24 hours and subjected to a WST assay to determine total metabolic cellular activity. Increasing concentrations of mifepristone inhibited proliferation and cellular activity in PECs but not in podocytes. Note that a dose of 100 μm mifepristone reduced cellular viability in PECs (A) but not in podocytes. **P<0.01. (G) When treating primary PECs or podocytes with increasing doses of prednisolone and mifepristone simultaneously, prednisolone inhibited proliferation in both cell types, but this trend did not reach significance. Mifepristone inhibited proliferation specifically in PECs (red arrow; n=5). Data are expressed as mean±SD. Next, pharmacologic inhibition of GR signaling using mifepristone was tested in WT mice with crescentic nephritis. Mifepristone reduced proteinuria, preserved renal function and podocyte numbers, deactivated PECs, and inhibited formation of proliferative lesions (cellular crescents) compared with untreated controls (Figure 6, A–E). Glomerular deposition of sheep and mouse IgG was similar in all experimental groups (Supplemental Figures 3C, 4, and 5). Additional genetic inactivation of GR on top of mifepristone treatment resulted in a nonsignificant trend toward a more effective amelioration of the nephritis—possibly because GR was genetically inactivated from the beginning of the NTN model, whereas pharmacologic treatment was initiated only 7 days after initiation of NTN (compare mifepristone-treated WT with mifepristone-treated KO in Figure 6, A–E). Mifepristone treatment exerted positive effects on podocyte survival, although additional genetic inactivation of GR was more effective (Figure 6, G–I). The systemic inflammatory response seemed unaffected by systemic pharmacologic GR inhibition (using spleen weight as a surrogate parameter) (Figure 6J). Within the kidney, infiltrating T cells were reduced by pharmacologic GR inhibition. Pharmacologic GR inhibition by mifepristone was verified by mRNA expression analysis of the two above–mentioned GR–regulated genes, forkhead box O3 and glucocorticoid–induced leucine zipper. As shown in Figure 6M, mifepristone downregulated the expression of both genes. Pharmacologic GR inhibition attenuates the crescentic nephritis model. (A) Experimental setup. (B) Albuminuria was reduced significantly by the GR antagonist mifepristone (20 mg/kg per day subcutaneous treatment). Note the logarithmic scale of the y axis. (C–F) Analysis of serum creatinine, CD44-positive glomeruli, number of crescents (i.e., proliferative lesions), and proliferating cells (mainly PECs) 14 days after NTN serum injection. (G and H) Podocyte numbers (p57-positive cells) were preserved and (I) TUNEL-positive cells were reduced by GR inhibition. (J) Spleen weights were unaffected by pharmacologic or genetic GR inactivation or both. (K and L) Infiltrating CD3–positive T cells were reduced by GR inhibition. KO, Pax8-Cre/GRflox KO mice. (M) The effect of mifepristone on expression of two GR-regulated genes, forkhead box O3 (Foxo3a; P=0.03) and glucocorticoid–induced leucine zipper (GILZ; P=0.05 [NS]), was verified by RT-PCR (data are expressed as mean±SD; t test). *P<0.05 (NS); **P<0.01; ***P<0.001. Glucocorticoids were introduced empirically for GN treatment several decades ago and have remained an essential therapeutic approach since that time. In this study, the effects of glucocorticoids in GN were investigated in vivo. We report three major findings. In the first major finding, a nonimmunologic mechanism of glucocorticoid action was identified. Cell–specific GR inactivation showed direct effects on activated PECs in the setting of crescentic GN for the first time (Supplemental Figure 6, A and C). In addition, we confirmed previous reports that podocytes can respond directly to glucocorticoids and that glucocorticoids prevent loss of podocytes.10,18,19 Our results indicate differential effects of glucocorticoids depending on the cell type. In podocytes, GR signaling influenced the actin cytoskeleton (consistent with previous reports in vitro20), ameliorated injury, and promoted survival. In PECs, glucocorticoids decreased cellular crescent formation and inhibited proliferation and migration, explaining the decreased formation of proliferative lesions in this study in vivo. In this study, other glucocorticoid actions apart from direct actions on glomerular cells and immune cells cannot be excluded. These unknown effects may be relevant to the findings of this study; however, considering that GR inactivation alone abolished about 70% of the disease activity in this study, other possible unidentified effects should be expected to be less prominent. The second major finding is that inhibition of GR signaling ameliorated GN as effectively as high–dose glucocorticoid treatment (Supplemental Figure 6, B and D). Mifepristone is a partial GR antagonist with low levels of intrinsic activity and low gestagen activity.21 It is unlikely that gestagen activity contributed significantly to the observed effects, because the same phenotype was observed by genetic and kidney-specific KO of GR alone and because gestagens were compensated for in our in vitro experiments and did not modify the experimental results (data not shown). Our results suggest that GR inhibition may be a potential alternative to conventional glucocorticoid therapy in treating patients with GN. To date, there are no known inactivating mutations in GR that are linked to hereditary forms of renal diseases—consistent with our finding that genetic deletion of GR in renal epithelial cells did not impair renal development or function. Systemic pharmacologic inhibition of GR using mifepristone is associated with fewer side effects compared with high–dose glucocorticoid treatment in humans (e.g., no striae or weight gain; no catabolic, immunosuppressive, or diabetic effects; and no significant CNS effects).21–23 Mifepristone was chosen as the GR antagonist for this study, because the drug is already approved for other indications and because of its low intrinsic activity (to prevent glucocorticoid withdrawal syndrome). Of note, glucocorticoid withdrawal may be induced by mifepristone in patients on chronic glucocorticoid treatment. The novel alternative therapeutic approach may be particularly important in the acute setting of crescentic GN, where very high glucocorticoid dosages sometimes cannot be used because of significant comorbidities (e.g., infections, psychiatric conditions, etc.). This study is the first to identify a therapeutic approach targeting activated PECs, which is the third major finding. Direct actions of immunosuppressive agents on podocytes have already been identified previously, particularly for inhibitors of calcineurin26 and mammalian target of rapamycin signaling.27,28 Because activated PECs have been identified within proliferative lesions in crescentic GN, it was predicted that these glomerular diseases should be ameliorated by one common therapeutic intervention, namely inhibition of PEC activation.4,6 We now provide the first evidence that one of the oldest and most effective therapeutic interventions in kidney disease (glucocorticoids) acts at least in part in this fashion. The results also support the notion that activated PECs play a negative role in GN, a hypothesis that has not been experimentally proven so far. The local institutional review boards approved all studies. Animals were held in rooms with constant temperature and humidity and 12-hour/12-hour light cycles, and they had ad libitum access to drinking water (ozone treated and acidified) and standard murine chow. Pax8-Cre12 mice were crossed with GRflox29 mice and bred on an SV129 background for at least eight generations. Matched littermates were used for all experiments. Levels of creatinine in serum and urine (enzymatic determination using the test kit Creatinine Plus Version 2; Roche Diagnostics) and urea nitrogen were analyzed using a Hitachi 9–17-E Autoanalyzer (Hitachi, Frankfurt am Main, Germany). Albumin level in urine was measured by a competitive two–step enzyme immunoassay using as first antibody rabbit IgG to mouse albumin (MP Biomedicals). For light microscopy, the 3% buffered formalin–fixed kidney fragments were dehydrated and embedded in paraffin. Two-micrometer paraffin sections were stained with PAS. The immunofluorescence staining was performed on 2-μm paraffin sections. CD44, synaptopodin, Ki-67, and LKIV immunostaining was performed as described previously.31 The single–chain primary antibody (LKIV69) was detected using anti–VSV-Cy3 (Sigma-Aldrich). GR staining was performed using anti-GR (D8H2; 3660; Cell Signaling Technology). For podocyte counting, sections were stained using anti-p57 (H-91) antibody (sc-8298; Santa Cruz Biotechnology). The following secondary antibodies were used: donkey anti–rabbit, –mouse, or –rat Alexa Fluor 488 or Alexa Fluor 647 (Dianova). Terminal deoxynucleotidyl transferase–mediated digoxigenin-deoxyuridine nick–end labeling (TUNEL) staining was performed using ApopTag-Kit (S7160; Millipore). The nuclei were stained using Hoechst 33342 (Sigma-Aldrich). Sections were evaluated with a Keyence BZ-9000 Microscope using BZ-II Analyzing software (Keyence Corporation). Formalin–fixed paraffin–embedded sections of renal biopsies from 30 subjects with RPGN (type 1: antiglomerular basement membrane; type 2: immune complex GN; type 3: pauci-immune) or primary idiopathic FSGS with nephritic-range proteinuria were used for analysis. The collection of human samples was approved by the local ethics committee of the Medical Faculty in Heidelberg, Germany (254/1999). In addition, unaffected renal tissue from patients with renal carcinoma, provided by the Biobank of the Pathology Department of RWTH Aachen University, was used as controls. We also studied kidney biopsies from other subjects with various glomerular diseases but no crescentic lesions as controls. We performed triple-immunofluorescence studies using the following antibody combinations: anti-CD44 human (156-3C11; BD Biosciences) or antisynaptopodin (P-19; sc-21537; Santa Cruz Biotechnology) and anti-GR (3660; Cell Signaling Technologies). The following secondary antibodies were used: donkey anti–rabbit, –mouse, and –rat Alexa Fluor 488 or Alexa Fluor 647 (Dianova) and anti–VSV-Cy3 (Sigma-Aldrich). For detection of glomerular deposits of sheep IgG, mouse IgG, and complement component 3, the following antibodies were used: Alexa Fluor 647 donkey anti–sheep and Alexa Fluor 488 donkey anti–mouse (formalin fixed and paraffin embedded; Life Technologies) and FITC–labeled anti–mouse C3 (PFA-fixed cryosections; Cedarlane Labs). Immunohistochemistry was performed on 2-μm paraffin sections. Sections were blocked with an avidin/biotin blocking kit (Vector Laboratories, Burlingame, CA) and 3% H2O2. The sections were subjected to microwave antigen retrieval in Antigen Unmasking Solution (Vector Laboratories) followed by incubation with the primary and secondary antibodies. The primary antibodies used are as follows: antiphospoextracellular signal–regulated kinase (4370; CST), rat polyclonal anti–CD3 (T lymphocytes; MCA1477; Serotec), rat monoclonal anti–mouse anti–ER-HR3 (monocytes/macrophages; T2012; Biomedicals, Augst, Switzerland), and anti-CD44 (156–3C11; BD Biosciences). As secondary antibodies, we used biotinylated goat anti–mouse, goat anti–rabbit, goat anti–rat, and goat anti–chicken (Vector Laboratories). Detection was carried out with the VECTASTAIN ABC Kit (Vector Laboratories) with the use of peroxidase as label and 3,3′-diaminobenzidine as substrate and nickel chloride enhancement. Negative controls for the immunohistochemical procedures consisted of substitution of the primary antibody with nonimmune IgG. In the PAS-stained sections, the number of glomeruli containing extracapillary proliferates was quantified. For CD3 and ER-HR3 staining, positively stained cells per 20 randomly selected visual fields were counted. For Ki-67 and TUNEL quantification, 50 glomeruli were analyzed from one kidney section, and the total number of Ki-67–positive or TUNEL-positive cells was determined. For the quantification of positively stained cortical areas, renal tissue was evaluated by computer-based morphometry using the analysis v3.1 software (Soft Imaging System GmbH). All analyses were performed in a blinded manner. Sections were analyzed using a pulsed Ti-Sapphire laser (MaiTai DeepSee; SpectraPhysics) attached to an upright two–photon microscope system (FV1000MPE; Olympus). A 25× water immersion objective was used for imaging (1.05 NA and WD 2.0). For fluorescence excitation of Hoechst, Alexa Fluor 488, and Alexa Fluor 594, the laser was tuned to a wavelength of 800 nm. The emission signals of Alexa Fluor 488 and Alexa Fluor 594 were collected with bandpass filters at 419–465, 495–540, and 590–650 nm. A series of three subsequent images over the depth of 3 μm was recorded with a z step of 1 μm. Image analysis was conducted with ImageJ v 1.48; 20–25 glomeruli per section were analyzed as described earlier.15 Section thickness was 3 μm, and a correction factor of 0.3 was used for further calculations. The podocyte number was calculated with the following formula: Nt(corrected podocyte number) =No(podocyte count) × correction factor. Density of the podocytes was determined by dividing the total tuft volume (in cubic micrometers) by the corrected podocyte number (podocytes ×106 μm3). A z projection of each image stack was used to measure the glomerular area and for automated counting of p57-positive nuclei after thresholding. The automated podocyte count was compared manually with the image stacks to exclude false positive or negative podocyte counts. Mouse anti–sheep IgG titers were measured by ELISA using sera of the injected mice collected at day 14 after induction of nephritis as previously described.32 In brief, ELISA microtiter plates were coated with 100 μl sheep IgG (100 μg/ml; Sigma-Aldrich) in carbonate-bicarbonate buffer overnight at 4°C. After blocking with Blocking Solution (Thermo Fisher), plates were incubated with serial dilutions of mouse serum (1:10–1:50) for 1 hour at room temperature. After washing bound mouse, IgG was detected using peroxidase–conjugated anti–mouse IgG (Vector Laboratories). Crossreactivity of the secondary antibody was ruled out by omitting the mouse serum. ImageJ was used to quantify the percentage of stained glomerular area of sheep IgG, mouse IgG, or C3 per glomerulus. Images of 30 glomeruli per kidney section were analyzed. After thresholding, the stained glomerular area was determined automatically and divided by the total glomerular area selected. Results are presented as percentages. Small pieces of renal cortex were fixed in 4% glutaraldehyde, postfixed in 1% osmium tetroxide, and embedded in Araldite M (Sigma-Aldrich). Ultrathin sections were counterstained with uranyl acetate and lead citrate and examined in a ZEISS 910 Transmission Electron Microscope. Images were taken at ×6300 magnification. Total RNA was isolated from renal cortex tissue using the RNeasy Mini Kit (Qiagen). Sample purity and RNA content were determined by ultraviolet spectrophotometry. RT-PCR was performed using the qPCR Core Kit (Eurogentec) and carried out using an ABI Prism 7300 Sequence Detector (Applied Biosystems). All quantitative data from the real–time RT-PCR were normalized using GAPDH as an internal control and calculated using the ΔΔCt-method. Data were presented as mRNA expression relative to the mean of control–treated WT mice. Primer sequences are listed in Table 1. Cellular lysates were prepared by homogenization in RIPA buffer (150 mM NaCl, 50 mM Tris⋅Cl, pH 8, 1% NP40, 0.5% deoxycholic acid, 0.1% SDS, 5% glycerol, 2 mM CaCl2, and 10 mM EGTA) including protease inhibitors (P8340; Sigma-Aldrich) and phosphatase inhibitors (Roche) on ice. NuPAGE 4%–12% Bis Tris Zoom Gels (Invitrogen) were loaded with 2–15 μg protein per well. Proteins were transferred onto nitrocellulose membranes (Amersham Bioscience) followed by reversible Ponceau S staining (P7170; Sigma-Aldrich). The membrane was blocked overnight in Roti-Block (Carl Roth GmbH) and incubated with the indicated antibody diluted in Roti-Block. The primary antibodies were as follows: anti-CD44v6 (VFF7; AbD Serotec); anti-GR (3660), antiphospho-S6 (4858), and antiphosphoextracellular signal–regulated kinase (4370; Cell Signaling Technologies); and anti–β-actin (P0372; Sigma-Aldrich). HRP–labeled goat anti–rabbit or goat anti–mouse (Q0303; Vector Laboratories) was used as secondary antibody. ECL or SuperSignal West Femto Maximum Sensitivity Substrate (Thermo Scientific) was used for detection in an LAS-3000 Imager (Fujifilm). Outgrowths of glomeruli were analyzed as previously described16 as a model system of glomerular crescentic lesion formation (proliferation and migration). We isolated decapsulated glomeruli as described.17 Outgrowth of >30 glomeruli in total was analyzed per condition. We verified glomerular epithelial cell phenotype by positive staining for WT1 (anti-WT1 antibody; sc-192; Santa Cruz Biotechnology) and quantified cellular outgrowth area and density. Phalloidin-rhodamine B (Sigma-Aldrich) staining was used to visualize stress fibers. Glomerular epithelial cells of proven origin were used and cultured as described previously.17 Cells were passaged when 70%–90% confluency was reached and seeded at 1–5×105 cells per 1 ml media. Briefly, to study the cell type–specific effects of glucocorticoid treatment, we incubated the cells with different doses of prednisolone (0–300 μM; MERCK) for 24 hours with or without different doses of GR receptor antagonist RU486 (2–100 μM) as previously described.33 We used a wound scratch assay to assess podocyte and parietal cell migration. For this, cells were seeded in six-well plates, and a scratch was created using a sterile 200-μl pipette tip. Loosely adherent cells were washed away by washing three times with PBS. Cells were fixed 12 hours later, and the distance between the two monolayers was measured using ImageJ. Cell proliferation was measured using WST-1 and BrdU Assay ELISA (Roche) according to the manufacturer’s recommendation. Data are expressed as mean±SD. For assessing differences between two datasets, a two–tailed Mann–Whitney U test was used. For experiments with more than two datasets, the Kruskal–Wallis ANOVA followed by the Dunn multiple comparison test was used. Values of P<0.05 were considered significant. All analyses were performed using Prism version 6 for Macintosh (GraphPad Software). All analyses were performed in a blinded fashion. We thank Prof. Günther Schütz (German Cancer Research Center, Deutsches Krebsforschungszentrum, Heidelberg, Germany) for GR floxed mice. C.K. was supported by Else Kröner Fresenius Foundation grant A200/2013 and a START and Rotationsstellen Program of the Faculty of Medicine of the Rheinisch-Westfälische Technische Hochschule (RWTH) Aachen University. Support came from German Research Foundation (DFG) grants BO 3755/1-1 (to B.S. ), SFB938 (to H.-J.G. ), and 1118 (to H.-J.G. ); grants TP17 (to J.F. and M.J.M. ), TP25 (to J.F. and M.J.M. ), and Q2 (to J.F. and M.J.M.) of Sonderforschungsbereich (SFB)/Transregio 57 of the DFG; and the consortium STOP-FSGS by the German Ministry for Science and Education (grant BMBF 01-GM1518A to M.J.M.). This work was supported by the Core Facility Two-Photon Imaging of the Interdisciplinary Center for Clinical Research Aachen within the Faculty of Medicine of RWTH Aachen University. J.F. and M.J.M. are members of the SFB/Transregio 57 DFG Consortium Mechanisms of Organ Fibrosis. M.J.M. was awarded a Heisenberg professorship (DFG grant MO 1082/7-1). H.-J.G. and M.J.M. contributed equally to this work. This article contains supplemental material online at http://jasn.asnjournals.org/lookup/suppl/doi:10.1681/ASN.2016010060/-/DCSupplemental.